It's cold enough here! I have no desire for even more cold and prairie windchills! Oh how I'd love to be able to say that is the coldest we've hit so far! One more...Moose Jaw (Lola was the photographer). I feel sorry for the horse (and all the other animals here as they haven't had time to grow much of a winter coat before this cold snap came to visit). Well maybe a few more if my husband took our camera with him to Regina. 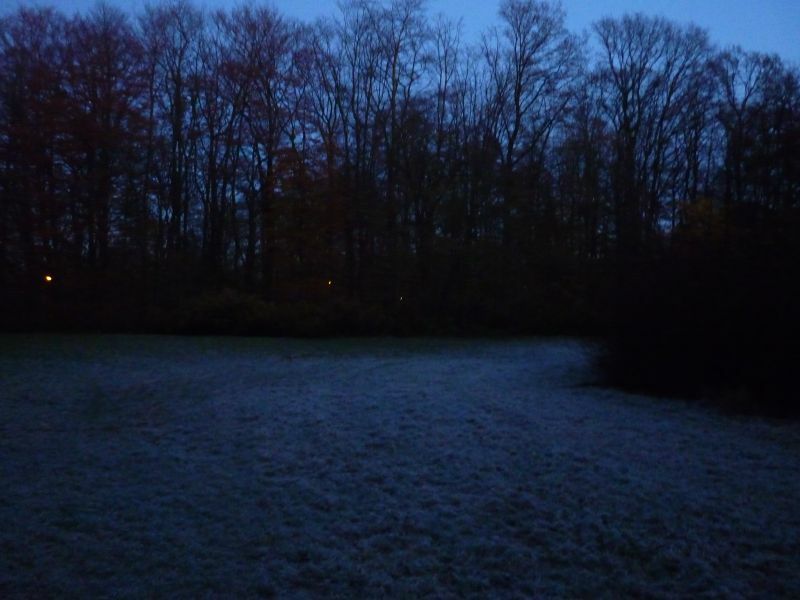 The frost stayed all day today in some sheltered shady places, so despite a high of around 5°C in the afternoon, there still was a lot of frost on the grass when i took this picture (around 4:45 PM, half an hour after sunset). Temperature was around 1°C then. Was surprised to see such hills in SK. Though, now that I think of it, posting a link to the summer thread is like twisting a knife in the wound. 3.8/1.7°C (38.8/35.1°F) and overcast today in the Tórshavn of the south. When are these supposed to shed their leaves? Winter is in one week! These blocks are the same color as the sky. They probably painted them this color to make them as discreet as possible. Is that some light at the horizon? not really though as I don't mind these temps too much (esp when I know we will be warming up again)...its when we hit the -30's and lower that I'm not feeling particularily joyful. That period, that the above pictures were shot in, was really hot and I'm not fond of really hot weather either (I like it when our daytime high is in the mid to high 70's and when our nights are in the 50's/low 60's). I expect us to get cold but just wish the extreme deep freeze would come after Christmas (the snow can come just before ). Even though those hills continue along even below my city/farm (though not anywhere near as high an elevation) I too am always surprised to see them in this province. Love those evening shots of yours...what is the building that has the red light shining on it? I guess if I lived in SK I'd welcome any above average spell, be it in winter, spring, summer or fall. Anything that can help shorten those frigid winters. The red dome building is the Printemps department store. Ah, the corner of Boulevard Haussmann and Rue Auber. Taken from the tower of Printemps, I presume. Damn I'm good! Should sign up for a private detective. And I didn't notice your revealing of the place. Wow you're good, especially about that boulevard one. Yeah, I should stop bragging about how dull it is here. You, along with Jesien and Hiromant, are out of reach. We've already had 40.3 hours of bright sunshine this month. Last year we had 20.8 hours to the 21st. That was a genuine (very) dull month, taking into account the more southerly latitude. I got the inspiration from the diagonal building in the first picture, as I have a similar building in SimCity 4, and figured if it could be along the Avenue de l'Opéra. But no, too far, you can't see the Tour Eiffel from there. Palais Garnier must be close, as it's revealed later. Then the landmark caught my eye, a Roman building, what could that be? La Madeleine, yes. Then i just "drove" around in the hood and saw the Printemps in the distance. Oh, that looks familiar, you've posted pics of it earlier, it MUST be somewhere around here. Then only the first diagonal street, and voilà! I've got a déjà vu feeling when google-driving in Leeds, and noticed that "dunno what to put here was here", but not actually been able to pinpoint a certain street from a random picture. But as long as you don't post a picture of your apartment building, everything is fine. Tallinn is the nearest place I can draw any reference to, and they've got 31.0 hours of bright sunshine in November. The two sunniest days were this week, and one of them was cloudy here. So if I estimate 27 hours in Turku, I'm probably not far off. I'm gonna ask for the fall totals at the end of the year, the FMI doesn't probably appreciate if I bombard them with questions all the time. Photos I (meaning my sister) took this past weekend, temperature range during our trip (0ºC to 5ºC), but it felt quite good because of the sun.